Every year I tell myself I will start planning early for Christmas. When the 5 kids were younger and we were less busy, I did start planning in the spring. I could relax in December and focus on holiday activities and making cookies with the kids. With my youngest son entering First Grade this fall, Christmas is going to be busy, hectic, and just plain stressful. Unless….I start planning now. There are things I can do now to help myself at Christmas time like making a list of people to buy for, making our family Christmas card, and pulling together the photos for the family calendar I give out to the grandparents. If you and I are going to enjoy a stress-free Christmas, we are going to have to prioritize, make plans and carry them out, and delegate. 1. Determine your priorities as a family. 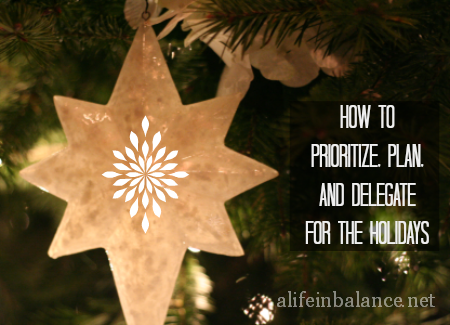 Be mindful of the season your family is in, and include family members in the discussion of priorities. If you have little ones at home, you may not be able to go see The Nutcracker Concert in the city with them yet. On the other hand, maybe a Christmas story time at the library would be a better fit. 2. Write down all must-do commitments on the November and December calendars. You need to know your commitments before making plans or prioritizing. If your children are in a school play, you need that date on the calendar and then, information about the costumes and the rehearsal schedule. If you’re hosting Christmas Eve dinner this year, yes, write that on the calendar. If you’re waiting on school calendars to write down dates, write yourself a reminder on September 1st, October 1st, and November 1st, to review dates for your family’s calendar. 3. Write down what needs to done for each event. All of these events on your calendar require actions. Look at the events and write down what needs to be done for each one. If you need a special outfit for the school conference, you can start looking in your children’s closet now and then go shopping. 4. Write down what needs to be done for Gift Giving and Traditions. Be clear and specific when you write down your action steps for these 2 areas. Each one needs a date, a person, and a time frame. Making holiday cards by hand takes a lot more time than buying them; it’s okay to buy cards this year. There’s always next year. Remember, it’s okay to have a simplified Christmas this year if that works for your current season as a family. People will understand if you don’t get the Christmas cards out on time, or bake cookies for the school party. Life with Kaishon recently posted..Hoodditt :: Valley Forge Casino Resort :: Win an Overnight Hotel Stay! Great tips Barb! THIS…This is the thing each year that I am most organized at, lol! I could never ever pull it off without all of my to-do lists (for shopping, food, gifts, santa stuff, etc)! Great tips! I need to sit down and map out when I need to do things. Most of the presents for our little one have been purchased, so I’ve got that covered so far. With all my husband’s traveling and my entire family coming for Thanksgiving, the holidays have definitely been on my mind. I’m trying to simplify gift giving this year. Not sure how, but I’m working through that now! Carrie recently posted..Secret Trick for Removing Sap from Hands in Seconds! Tara of Feels Like Home has a great ebook about getting ready for Thanksgiving. I think it was about $10. Way to plan ahead. I found that cutting back on gift giving lowered our stress a lot. Thanks for posting. Hello from Busy Monday. Yes, cutting back does help the stress level! great tips, Barb! As soon as our school year is in full swing I switch to Christmas planning mode, so I’ll be revisiting this post again, I’m sure. Thank you! I really need to start early this year. Working part-time on my blog has helped me see how important it is for me to be better organized. I’ve been thinking about getting ready for Christmas early, thanks for the push! Jennifer A recently posted..Building Independent Binders ~ Free Printable too! December is ALWAYS crazy for me with 5 kids. And, I like to get stuff done early if I can.